A poll released by Sacred Heart University showed that middle-income families in Connecticut are not only struggling to maintain their lifestyle but are largely opposed to tolls on highways which would increase their cost of living. 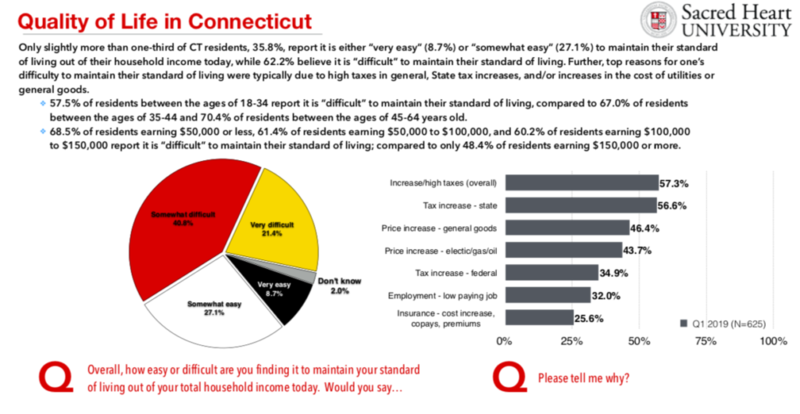 Sixty-one percent of respondents who earned between $50,000 and $150,000 per year reported it was “difficult” to maintain their standard of living in Connecticut and blamed high taxes and price increases. The percentage of people who reported life in Connecticut as being difficult closely resembled the 59 percent of people who opposed tolls on Connecticut’s highways. Seamus McNamee of Great Blue Research, which partnered with Sacred Heart University to conduct the poll, said the data shows increased opposition to tolls among Connecticut’s middle and working-class populations. McNamee also said the strongest opposition to tolls came from those earning less than $50,000 per year (61.9 percent) and those earning $50,000 to $100,000 per year (63.6 percent). “These two buckets of respondents also had the most difficulty maintaining their standard of living as well,” McNamee said. Critics say tolling Connecticut’s highways is a regressive tax that will increase the cost of living in Connecticut, not only by tolling commuters, but by increasing the cost of delivering goods to stores and customers. In a press release, Patrick Sasser, head of No Tolls CT said the poll confirmed what his organization already knew: that the majority of Connecticut opposes tolls. 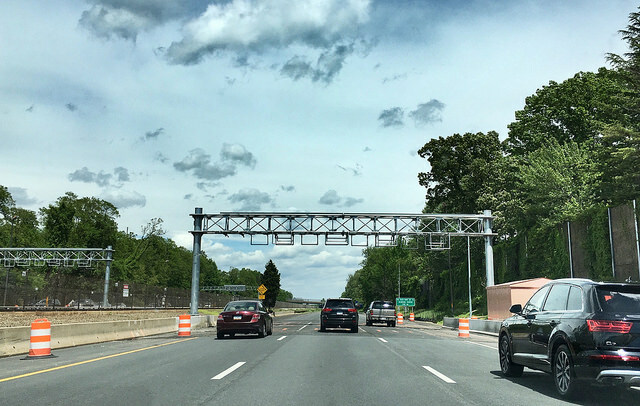 Proponents, however, say tolling is necessary in order to fix Connecticut’s aging infrastructure, thereby attract businesses and residents to the state. In a press release, Gov. Ned Lamont’s Senior Advisor Colleen Flanagan said the report showed that the majority of people favored tolls – if the funds were protected by the Transportation Lock Box. “The majority of Connecticut residents – over 50 percent – likely support tolling when they learn that the funds generated will be subject to protections, such as the state transportation lockbox, as approved by Connecticut voters, as well as federal law that mandates use on transportation infrastructure only,” Flanagan said. Lamont and other lawmakers have touted tolls as a way to fix Connecticut’s rail system, floating a 30/30/30 plan to make Connecticut’s trains on the Metro-North run faster. Connecticut drivers subsidize public transportation – including Metro-North – through the gasoline tax, petroleum gross receipts tax and a variety of vehicle taxes and fees. Spending on public transportation has grown significantly over the past 18 years and has included the construction of the CTFastrak bus line and the Hartford Rail Line which runs from New Haven to Springfield. While the Transportation Lock Box was passed in a November 2018 referendum, Lamont has proposed freezing a scheduled transfer of vehicle sales tax revenue to the Special Transportation Fund. The sales tax transfer is not protected by the lock box and freezing the transfer at 8 percent will deprive the STF of over $1 billion over the next four years, essentially bankrupting the fund by 2022. Sasser says Lamont is trying to spin the results of the poll in his favor. “This poll is just more proof that tolls are the wrong choice for Connecticut and you can’t spin that any other way,” Sasser said. Why is it that every single article, post, blog or whatever is discussing tolls that not ONE ever discusses the cost to install and the expense to operate each year. We all know that this state only talked about “revenue” and NEVER breathes a word about expenses. The only solution in my opinion is to cut expenses across the entire state. Will people’s location data be monetized too? How else might modern tolling erode our privacy? We already pay just over .48 cents a gallon in State Gas Tax. State cuts to local towns and cities means our property taxes have gone up again. We pay 5% at the minimum for Income Tax, a tax that was suppose to a be a temporary fix, and then rescinded. We pay Sales Tax on just about everything. As people continue to leave the state, the tax burden is being covered by fewer and fewer people which means higher and higher taxes. The Top Richest Men in CT have moved out, by claiming a residence in Florida they no longer have to pay the income tax here. Businesses are pulling out because of the taxes, and new business will avoid us like the plague because their Top Executives won’t want to give more 6.99% percent of their income as well as pay sales tax and luxury tax, and all the other taxes CT imposes. This has to stop, a freeze on all new taxes, and a department by department shake down of costs. It’s ridiculous the only way out is to attract new businesses and people into the state, and nothing he’s doing would do that at all. lamonts tax and toll proposals have set a new level of anxiety for me. if he gets what his lying face wants, then i cant afford to stay in CT. sadly, i cant afford to leave either, so whats a girl to do? barely getting by now, all his proposals will definately put me under water. I did relocate down south to TN after living in CT for 25 years. I miss CT daily, truly I do, BUT I have a better standard of living, no state income tax or ad valorem, no long waits in Motor Vehicle lines, friendly and helpful people, lots of outdoor activities, handcrafting and farm-to-table eating are in. Downsides: too much fried food, high sales tax, it’s a Red state and the Bible belt (you might consider that a plus), humidity. You’ll have to come soon because northerners are discovering it and costs are going up. Gas is lower by 50¢ – $2.21 right now. We now have really good entertainment – Jersey Boys, The Book of Mormon, Rain, Peter Frampton, Chicago.. have performed here. I’m in Chattanooga, 2 hours south of Nashville and 2 hours north of Atlanta. I don’t like the heat, but I do like it that horns don’t honk and there will never be tolls. You can sell your home, your stuff, and start over quite reasonably. Rents from $700-800 are available and nice. Nicer is about $950. With a roommate, it’s very doable. no tolls! It’s just another tax, disguised by a ‘toll’ label. We see very little talk/action to reduce government costs, just more taxes to cover irresponsible spending. How could more taxes in any way attract new business or new residents….how crazy is this train of thought…the residents have been dug into a gigantic bottomless hole whenever it comes to the budget..time to dig us out not dig us deeper. Resist! No tolls! Lamont a list trucks only B.S.